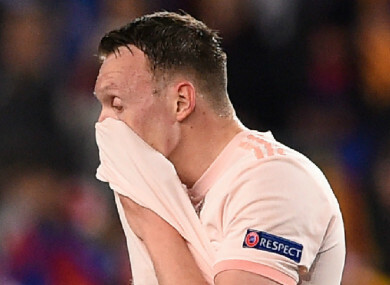 Phil Jones pictured during the Barcelona game. Ole Gunnar Solskjaer’s men made some unwanted history in the defeat, with Man Utd suffering their worst ever European knockout-round defeat over two legs. “For Marcus Rashford, he recognises what the elite level is in terms of club football,” Neville told beIN SPORTS. “[For] Scott McTominay, it’s a big lesson for him over the two games, he’s done well in the games but some of the others, they’re not good enough. Tuesday’s defeat was the fifth in seven matches for Man Utd after a hot start under Solskjaer, and Neville believes the club’s performances in recent weeks are a more realistic indicator of their current level. “I think Ole knew that for the last couple months. The first couple months in the job, everything was rosy, everything was perfect, the players were playing at a level that, to be fair, I’d not seen, they’d not shown. Pogba is now playing how he was pre-Ole’s arrival,” Neville said. “I thought tonight he was really poor, rolling his foot over the ball all the time, playing for himself, not popping up and moving, [he] didn’t look interested at times. Email “Neville: Manchester United need an entirely new defence”. Feedback on “Neville: Manchester United need an entirely new defence”.